At a time when so many cracks have emerged within the imagined community of ‘the West', this important new book, by one of the leading social scientists in Europe, examines the intellectual history of comparing Europe and the United States. Claus Offe considers the perspectives adopted by three of Europe’s greatest social scientists – Alexis de Tocqueville, Max Weber and Theodor W. Adorno – in their comparative writings on Europe. While traveling, studying and working in the US, all three constantly looked back to their European origins, trying to decipher from their American experience what the future may hold for Europe, be it for better or worse. Alexis de Tocqueville, the French aristocrat, observed the functioning of American democracy with a mix of admiration, envy and deep concerns about the fate of liberty in the ‘democratic age'. Max Weber, the German sociologist, reported enthusiastically about the youthful energy he found in the United States, which, however, he saw as gradually succumbing to the stifling tendencies of European bureaucratization. Theodor W. Adorno, the critical theorist and refugee from Nazi Germany, observed with a sense of despair the workings of the American ‘culture industry’ which he equated to the totalitarian experience of Europe, only to switch to a much more favorable picture upon his return to Germany. Europe and the US are conventionally assumed to share the same trajectory and develop according to some common pattern of ‘occidental rationalism', with the observed differences resulting from mere lags and relative advances on one side or the other. In this insightful book, Offe questions the relevance of this paradigm to transatlantic relations today. 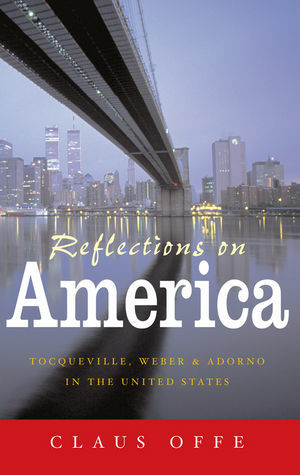 A highly topical book which examines the intellectual history of comparing Europe and the United States. Claus Offe considers the perspectives adopted by three of Europe's greatest social scientists - Alexis de Tocqueville, Max Weber and Theodor W. Adorno - in their comparative writings on Europe and the US. Written by one of the leading social scientists of Europe. Questions the relevance of the paradigm of the shared political and social development of Europe and the US to transatlantic relations today.